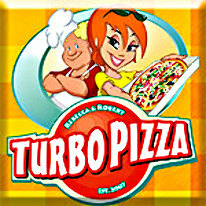 In Turbo Pizza, you have full control over the future of Rebecca and Robert's pizza destiny. Decide when it's right to purchase new appliances, better menu options, or put resources behind developing Rebecca and Robert's skills. Save enough money to open a second location in an even MORE unique setting. Meet your customer's needs and word of mouth will bring the masses. Remember though, different customers have different needs. Hey, no one said becoming a restaurant mogul would be easy!